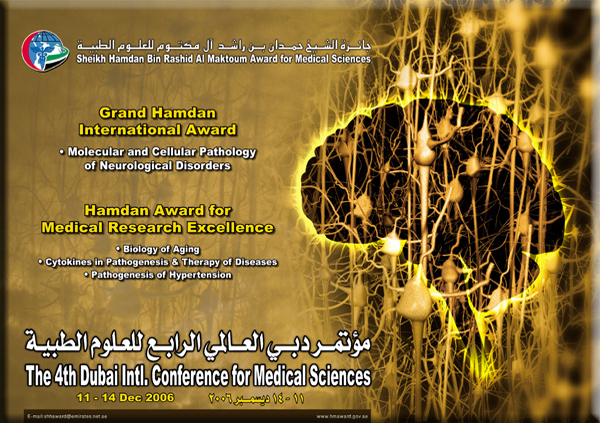 The topics of the 4th term, 2006-2005 were selected to be for Grand Hamdan International Award - Molecular and Cellular Pathology of Neurological Disorders, and for Hamdan Award for Medical Research Excellence - Biology of Aging, Cytokines in Pathogenesis & Therapy of Diseases, Pathogenesis of Hypertension. Biology of Aging comprises a group of irreversible biological changes that occur in all living things with the passage of time eventually resulting in death. There is a growing awareness that age-related deterioration will affect an ever growing number of people, in both absolute and relative terms. The process of aging is genetically determined and environmentally modulated. Advances in molecular biology have provided new insights into the process of aging at the cellular level with the aim to identify genes involved in multi factorial diseases of the old and in longevity. Whenever the mechanisms of senescence and death may be more completely understood, there might be a chance to prevent and/or delay many of the adverse effects associated with aging, including most of the common diseases, and possibly also of extending lifespan. Infected cells of the immune system produce cytokines and other molecules to signal adjacent uninfected cells to mount their defenses to impair the growth of invading pathogens. Cytokines are soluble components and critical to a myriad of fundamental homeostatic and path physiological processes such as fever, wound healing, inflammation, tissue repair and fibrosis. They play important roles in regulating cell function such as proliferation, migration, and matrix synthesis. Accumulating evidence implicates inflammatory processes in the development of a number of neurodegenerative diseases and demonstrates that neurons can be a source of various cytokines, which are believed to be involved in neuropathy, and therefore can serve as targets for therapeutic treatment. The use of recombinant cytokines mobilizes innate and acquired immunity. The use of cytokines does also improve the bactericidal efficiency of certain antibiotics, could promote improved healing, and cardiac remodeling post myocardial infarction. Hypertension (high blood pressure) is defined as a repeatedly elevated blood pressure exceeding a systolic pressure above 140 with a diastolic pressure above 90 mmHg. The end organ manifestations of hypertension are striking and include higher rates of stroke, significantly increased renal disease including end-stage renal disease requiring dialysis, higher risk of ventricular hypertrophy, and an associated higher risk of heart failure. The cause of these more aggressive end organ phenomena is likely multi factorial and includes a mix of genetic and environmental influences. A clearer understanding of the pathogenesis of hypertension will probably lead to more highly targeted therapies and to greater reduction in hypertension-related cardiovascular disease morbidity that can be achieved with current empirical treatment. Professor Colin Masters is a native of Perth, Western Australia, and did his undergraduate and postgraduate training in medicine and in medical science at the University of Western Australia. He is currently Professor of Pathology in the University of Melbourne and Consultant, Chief of the Neuropathology Laboratory, and Chair of the Senior Scientists Council at the Mental Health Research Institute in Victoria. Prof. Charles Dinarello was born in 1943 in Boston, USA, and graduated from Boston University. After completing his post graduate studies and receiving the degree of Master of Medicine from Yale University he went into employment in the profession. Prof. Murray Esler is a cardiologist and medical scientist born in 1943 in Geelong city in Australia. Since 1977 his appointment has been to the Alfred Hospital, Melbourne, Australia and the Baker Heart Research Institute (currently Associate Director and Head of the cardiovascular Neuroscience Division). Prof. Christian Haass was born in Mannheim at Germany in the year 1960. After his academic education in Biology in RuprechtsKarls University in Heidelberg, he completed his PhD in "cDNA cloning proteasome subunits". In his postdoctoral training he was a fellow in the Laboratory of Prof. D J Selkoe at the Centre for Neurological Diseases at Harvard Medical School in Boston, USA. Direct Aid is a Kuwait-based society undertaking charity work using a new technique based on extending support and relief to African peoples suffering from dire economic and social conditions. It was established by Dr. AbulrahmanAlsmeit in early 1981 with a view to assist Muslim and other poorer communities in the dark continent. The Human Appeal International was established in the emirate of Ajman through a royal decree issued by the Emirate's Ruler in1984. It is a humanitarian, charity and voluntary non-governmental agency functioning in the areas of development and relief. It has branches all over the world, and financing offices in Britain, Australia and Denmark. Sir. Magdi Habib Yacoub was born in Cairo in 1935. His father was a surgeon himself, which provided Sir Yacoub a bigger inspiration for choosing this profession. He received his medical education in Cairo University, and decided to become a cardiac surgeon. In the heart of ancient Egyptian Civilization, the profession of medi cine always occupied a legendary position. Healers, as superpow ers and sources of inspiration, were credited with wisdom and art. 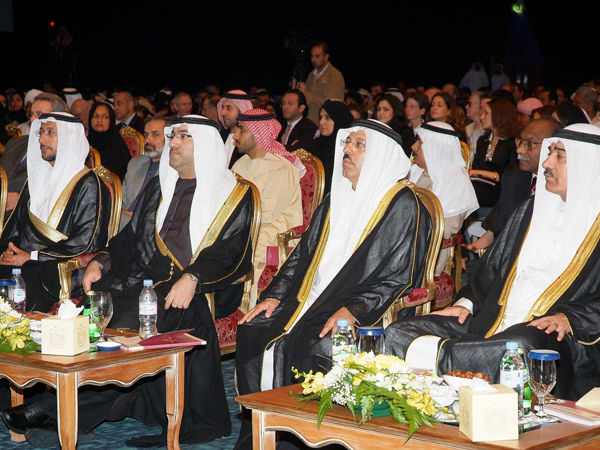 The College of Medicine and Medical Sciences, the first College established in May 1982 in the Arabian Gulf University, elected to develop and to implement an undergraduate curriculum with characteristics that would set it apart, being student centered, community oriented, problem-based learning and encouraging integrative learning. Inaugurated in 1995 under the patronage of HH Sheikh Hamdan Bin Rashid AI-Maktoum, Deputy Ruler of Dubai, Minister of Finance and Industry, President of the Department of Health and Medical Services, the Genetics Center is the only one of its kind in the Middle East and the Arabian Gulf region. It offers quality services in the diagnosis and management of known and rare genetic diseases under strict medical supervision by highly specialized staff. The Center has eventually attracted numerous patients from within the United Arab Emirates and from abroad. The Thalassemia Center in Dubai is the only such center in the United Arab Emirates and the Arabian Gulf countries. TCommencing its services in 1 989, it was then the only such center in the Middle East and the Gulf region. At both the regional and global levels, the Center remained unique in the quality of the services it offered to Thalassemia patients through the years. The Sharjah Blood Transfusion Center has achieved a strong reputation in the region, thanks to the model clinical services it offers which granted it international recognition. The center targets all age categories from newborn babies to old people. The only center of its kind in the UAE at the time of its inception, it has established and maintained a very high standard in meeting the country's needs with regard to blood collection, testing, and transfusion to patients who need blood or its components. Born in the emirate of Dubai, Mirza All Hassan AI-Sayegh received his primary and preparatory education at AI-AhliyaBSchool, which was established by his late father, All Hassan Al-Sayegh. He moved to Kuwait for his secondary education, and was the top student among the batch of Dubai learners there. 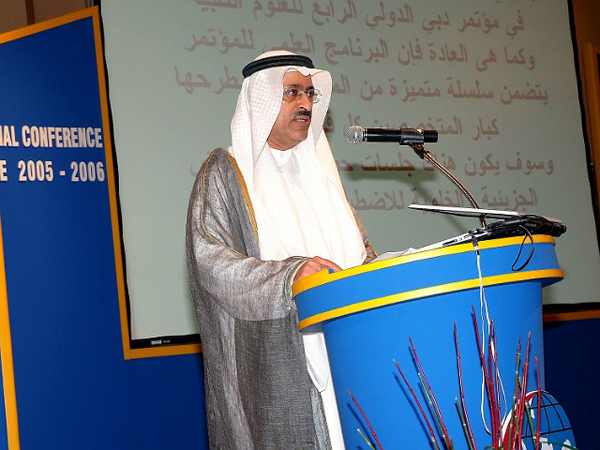 Born in the Emirate of Sharjah in 1949, Hamad Abdulrehman Al-Midfaa received his early education in the emirate, and then moved to Kuwait to study English literature. He gained a NBA from the University of Kuwait in 1971, and returned to Sharjah where he took up his first post as teacher of English at the Ministry of Education. In the history of Dubai certain people cannot be forgotten. Among those is a man who had lived in Dubai since the 1940s; A kind man, Doctor Muhammad Yasin who had come to the emirate in 1943. Born in the city of Nasserah in Palestine in 1945, the late Dr. Ahmad Yazbak studied medicine at the University of Alexandria Bin Egypt ultimately specializing in tropical medicine in Britain. He joined the Department of Health and Medical Services in Dubai in 1974 commencing his career as a doctor at Rashid Hospital. He was then promoted to general practitioner in 1976. Dr. Burwell Kennedy and his wife Dr. Marian Kennedy came to United Arab Emirates on an invitation from Late Sheikh DZayed Bin Sultan Al Nahyan and his brother Sheikh Shakhbutto start a hospital in Al Ain in the year 1960. Dr. Shahab Uddin was born in a small village, Mohammad Pur, District Azamgarh, India, in 1963. After completing his Delementary education from village Madrasa and secondary education from a local school, he joined Aligarh Muslim University. He majored in chemistry for his undergraduate degree and Biochemistry in his postgraduate studies. Dr. Maha Abdel Hadi is a Sudanese national, a graduate from West High School, IOWA USA in 1 977 who obtained her DMBBS from the College of Medicine and Medical Sciences, King Faisal University, Dammam, Saudi Arabia in 1984. Professor Adekunle Dawodu is a Professor of Pediatrics and Director of International Patient Care and Education, International PHealth Program, Cincinnati Children's Hospital Medical Center and University of Cincinnati, Ohio. He received his medical degree from the University of Ibadan Nigeria. Dr. Saadi was born in Lebanon in 1960. He obtained his medical degree from the American University of Beirut in 1 985. He subsequently trained in Internal Medicine and Endocrinology at Case Western Reserve University in Cleveland, Ohio, USA.